HINOJOSA, Rubén, a Representative from Texas; born in Edcouch, Hidalgo County, Tex., August 20, 1940; attended Mercedes High School, Mercedes, Tex. ; B.B.A., University of Texas, Austin, Tex., 1962; M.B.A., University of Texas-Pan American, Edinburg, Tex., 1980; business executive; member of the Texas state board of education, 1974-1984; adjunct professor, University of Texas-Pan American School of Business, Edinburg, Tex. 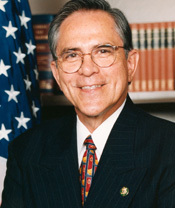 ; chairman, board of South Texas Community College for Hidalgo and Starr Counties, Tex., 1993-1996; elected as a Democrat to the One Hundred Fifth and to the nine succeeding Congresses (January 3, 1997-January 3, 2017); was not a candidate for reelection to the One Hundred Fifteenth Congress in 2016.